Getting the compensation you deserve after an injury or accident claim all depends on proving negligence and determining fault. By contacting an experienced personal injury attorney, you will be able to ensure that you get the justice you deserve. Duty of care focuses on another individual’s obligation to keep from injuring another is putting them in danger. Your attorney must determine who is owed the duty of care and how broad the duty of care is. After recognizing the duty of care in an accident or injury situation, the next problem to consider is if the duty has been fulfilled. In the event that there is a breach of duty, the individual is found to be negligent. In the event of a car accident, a driver that has been recklessly driving over the speed limit is indeed breaching their duty of care to drive safely. With the right personal injury attorney, you will be able to prove that the other driver was at fault. After it has been shown that the other driver breached their duty in your situation, the legal responsibilities for that driver have been established. In some cases, however, the other driver may claim that their breach of duty did not cause the accident. To counter this, your attorney must dig into the true cause of the accident and find the other driver at fault. The damages can refer to the emotional, physical and property damages, in addition to any lost income that the injured party may have suffered. The damages are what will determine the amount of compensation that you will receive. Basic road rules require every driver to keep a safe distance from other vehicles so that if they need to stop, there will be enough space and time for the other vehicles to slow down. 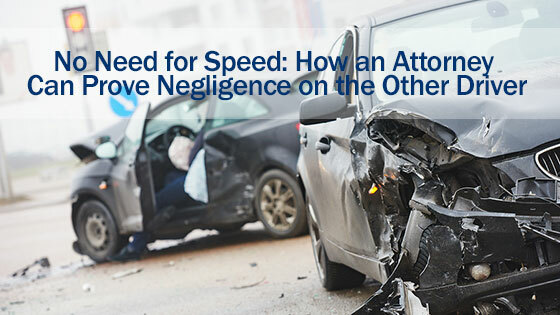 The speed of the other driver should be established to help determine if the driver was indeed negligent and driving above the speed limit. The damages to the vehicles will help determine the nature of the accident and who is at fault. If there were witnesses to the accident, these parties can help to establish the fault of the other driver, particularly if they are third-party witnesses. Any available pictures or video of the accident will help to prove that the other driver is at fault. The police report should include the alleged cause in the crash, as well as a citation for the other driver. The crash can be re-enacted to help settle your claim and determine the negligence of the other driver. In some car accidents, determining who is at fault is quite simple. In other cases, it can take a lot of time and evidence to understand which party is responsible. If you have been involved in a personal injury or accident due to a car crash, it is in your best interest to hire an experienced car accident attorney. Call our law offices today at any of our convenient locations and get a free consultation.